The climb out of the NOC. Overcoming blisters the first two weeks. 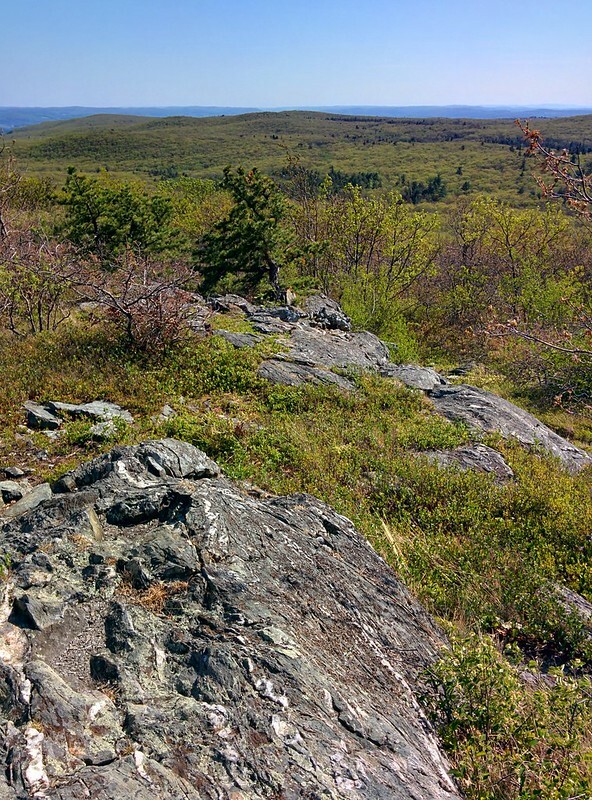 Connecticut isn’t a particularly difficult section of the trail. 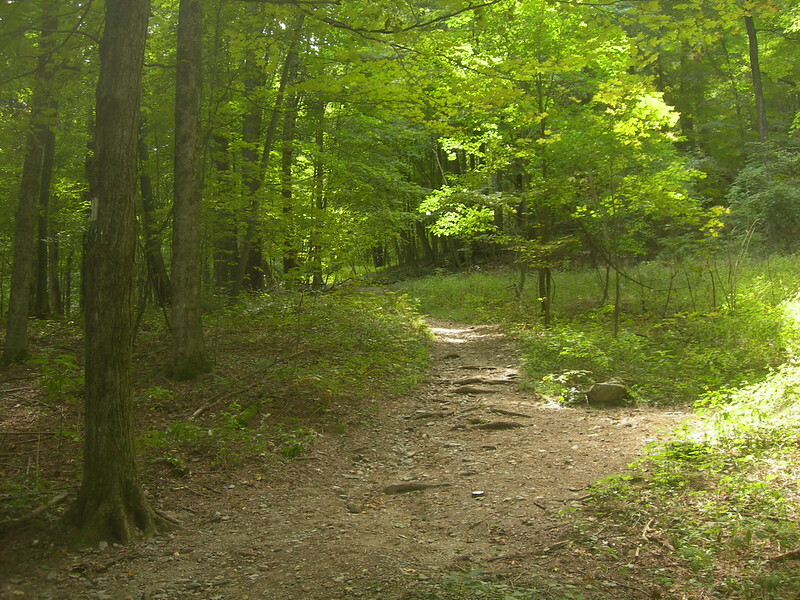 Its 52 miles is a blip to hikers in their stride doing 20 miles per day. Kent and Salisbury are friendly towns for resupply or just a cup of coffee. Its highest peak is a modest 2,316′ in elevation. It may be easier in general than New York or New Jersey. Connecticut’s River Road and the walk next to the Housatonic River are some of the longest and flattest sections on the entire AT. I crossed over into Connecticut after a hotel stay and on a full stomach. The plan was to meet up with my trail family at the Mt Algo shelter. Just another great day on the AT. The shelter log contained a note from my trail friends. They’d gone another 1.8 miles into town for the night. It was already late so I stayed put and would catch up with them the next day where they said they were headed. My phone was dead when I woke up. A drop had shattered the screen three months early in Hiawassee, GA. It reached Connecticut before the moisture must have finally creeped in. The first few miles dragged on and on. Steeper parts were catching me off guard. Heat, humidity, and bugs. I stopped to take off my pack and rest every half hour, and then every few minutes. Something was wrong, but I didn’t know what it was. I thought about seeing a doctor. It started down pouring in the way it does on the AT. I tried keeping my feet dry by stepping on the raised edges of the trail, but gave in and sloshed through the deep water pooling in the concave middle of the trail the rest of the way to Pine Swamp Brook Shelter. I got my dinner stuff out. Summer sausage, a knife, and rain led to greasy hands. The knife slipped and sliced my finger. I knew it was a bad cut by the amount of blood that came out before I could stuff my finger in a bandana. I was still behind my friends, but I couldn’t keep going in the rain with a bad cut. My finger stopped bleeding but I had to be careful not to let the cut open and start bleeding again. The shelter log had a note from my friends. “Moving on to catch Auto Draft!” They thought I was in front of them, and I couldn’t tell them I was behind because my phone was broken. They would be 8.5 miles ahead by the end of the night. I figured I may not catch up to them. The night of rest cleared my head. I realized dehydration was causing me to stop so many times the day before. 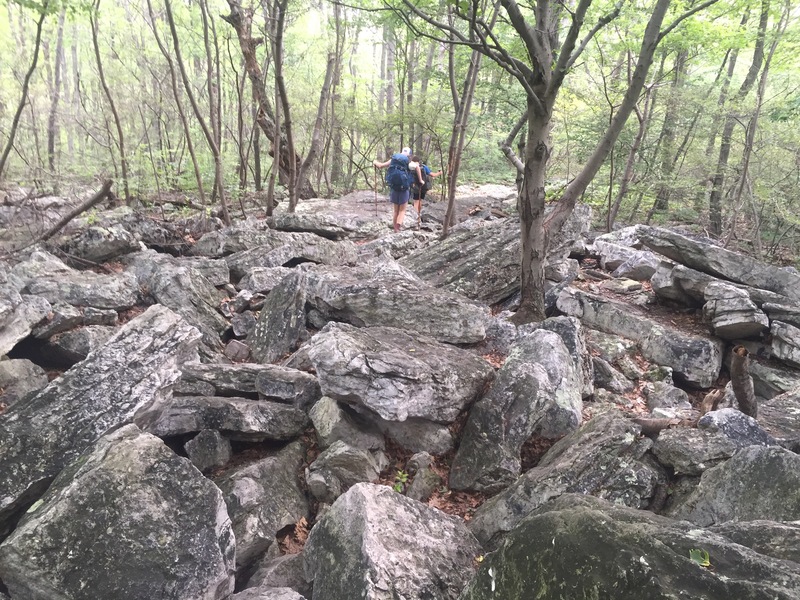 Somehow, I’d lost some hiking skills in Virginia and Pennsylvania. I reminded myself to take smaller steps up the steep parts. I made myself stop for water and actually drink it. And then, I hit the trail hard. One mountain went by and then another. I stopped on Bear Mountain (highest point in CT) for a minute and was about to push on when a family also up there offered me an apple. I conceded I wouldn’t be able to cover the last 8 miles that night, took the apple and enjoyed some conversation that went with it. I said good bye and kept on moving, trying to close the gap between my friends and me. It was getting dark and I started to panic a bit when I couldn’t find a camp spot for the night. Options were marginal at best, and I tried imagining how to improvise a spot. It wasn’t looking good. I got lucky and saw a level spot through some tree branches with just enough room for one tent. I crammed food in my mouth without cooking it and hung my bear bag. This spot was on a bed of red pine needles and the low sunlight was coming in through the side of the mountain, hitting my tent and making it glow. My toes and balls of my feet swelled and pushed together. A salt rash stung my lower back. I’d reached my limit, but I had gained about 6 miles on my friends. It would be my first and only time on the entire AT that I had a camping site entirely to myself – something I would cherish after the trail. Those days rudely reminded me about hydration, calories, hiking at my own pace, and taping up sore spots if I had any. I even put tape on my back where my pack was rubbing me raw. I went down the mountain and flew over the next one. A hiker told me he’d stayed at the same spot as my friends the night before, which meant they were close. The CT/MA border passed by and there they were on the trail when I came into a clearing. My quest to find my friends was finished. During these four days, I made friends with three hikers I didn’t know before, one of whom I’d hike with off and on for four more states. I got to spend my only night completely in solitude. 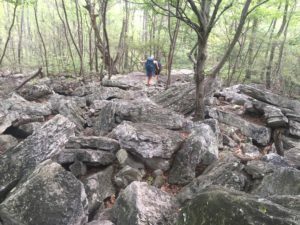 I didn’t expect Connecticut to be the hardest few days of my entire thru-hike, but it was. Getting through those days set me up to go the rest of the way.